Revised by 5 percent or more from previously published figures. (X) Not applicable. (NA) Not available. rRevised by 5 percent or more from previously published figures. communication wire, 130; Other insulated wire, 419. 5Represents uninsulated, bare, tinned, and/or alloy coated wire. 6Source: Bureau of the Census, Current Industrial Report M33E, Nonferrous Castings. 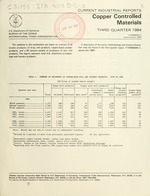 the first quarter 1984 report, ITA9008(84)-1, issued July 1984.